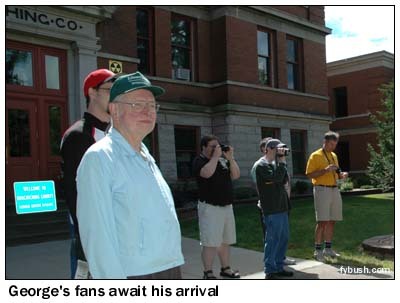 The third day of our 2005 Minnesota-Wisconsin trip, Saturday, August 13, was also the reason for the whole expedition - and it only involved radio tangentially, by way of my good friend George Greene, a fellow radio buff and a fellow travel buff. George, however, takes the travel thing a bit more seriously than I do. As a member of the "Extra Mile Club" (motto: "The shortest distance between two points is no fun! 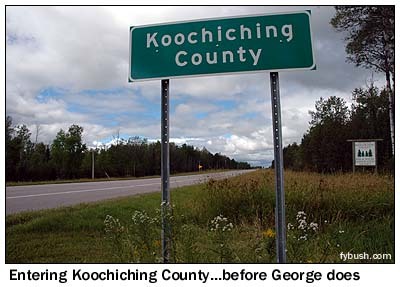 "), it was George's goal to visit all 3,121 counties in the continental U.S. As of a few years ago, he'd done 3,120 - and the one missing county was Koochiching, in northern Minnesota. 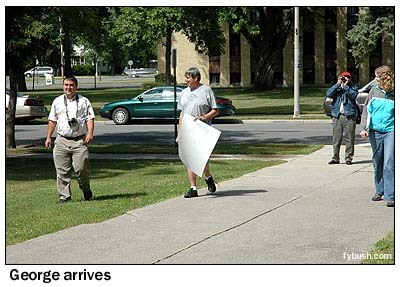 At 1 PM that Saturday, George would be crossing the border from Fort Frances, Ontario to International Falls, completing his counties - but what he didn't know was that in addition to the three friends traveling with him, another dozen of his friends had traveled from all over America to be there to surprise him and congratulate him on his accomplishment! 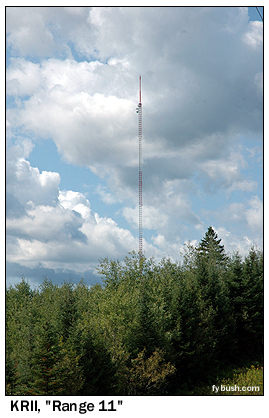 Just north of Eveleth is Virginia, and there we found the tower of WEEP (1400), rusting away after several years off the air. We crossed the line into Koochiching County ourselves about 11 AM, stopping to take a few celebratory photos before pressing on to International Falls for a quick lunch before George's scheduled arrival. Pulling up in front of the Koochiching County courthouse about 12:30, we find other members of the gang already waiting, and by 1:00, there are about a dozen of us from as far away as Boston, New Jersey, Omaha and San Francisco and as close as Bruce and Carol Elving from the Duluth area (as well as a bemused reporter/photographer from the International Falls Daily Journal) - waiting (and briefly getting rained on) with great anticipation. 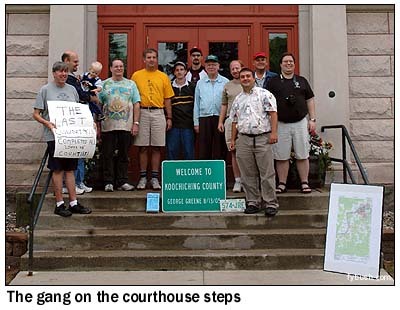 It turns out the gang heading south from Winnipeg got a late start - George, not knowing that a professionally-made highway marker reading "Welcome to Koochiching County, George Greene" awaited him, had to find a big piece of cardboard and a marker to make his own sign - and then got held up still longer at the border. It was well past 2 by the time their van came down the street, with George looking out the window wondering why all those people were standing in the way of his courthouse picture - and then wondering why they were all taking his picture! Once George figured out what was going on, and once he'd recovered his ability to speak, we all held a brief ceremony and presented George with his gifts, including that sign, a topo map of Koochiching County, and a book full of congratulatory letters from local officials and other George friends who weren't able to make the trip. And then, with rain threatening again, a few of us piled into the car to head across the international bridge (which passes right through a working paper mill) to Fort Frances, Ontario to see what was on the other side. 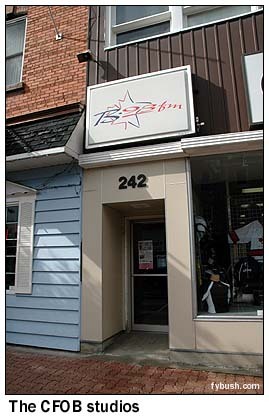 That turned out to be "not much" - downtown Fort Frances runs all of two blocks - but it did bring us to some interesting radio. 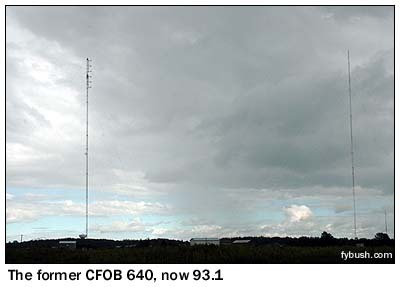 CFOB, the city's commercial station, had been off the AM dial for a couple of years, but its two-tower array that was formerly used on 640 still stands on the Trans-Canada Highway west of town, with one tower carrying the antenna bays of its replacement, CFOB-FM (93.1). The "B-93" studios are along that little downtown strip, but it's Saturday afternoon and the station's apparently automated. 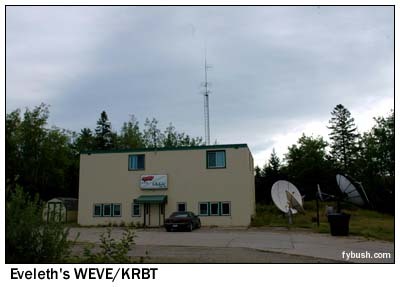 The rest of the radio dial here is made up of CBC relays (Radio One from Thunder Bay's CBQT, Radio-Canada from Winnipeg's CKSB) and a low-power FM on 92.3, which causes Bruce much consternation, since he didn't have it in the "FM Atlas" yet. After a rather lengthy and ultimately pointless examination upon recrossing the border (we'd emptied out the car of all of our luggage before going across, and all that was coming back with us was a small bag of newspapers and an Aero chocolate bar, a Canadian specialty), we set off to see the International Falls radio dial, such as it is. 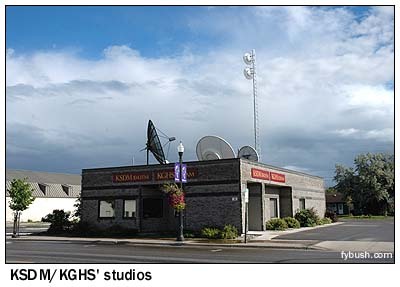 Commercial stations KSDM (104.1) and KGHS (1230) have their tower on a side road southeast of downtown, and their studios are right along the main drag just south of the border crossing. And then it was back to celebrating - a big dinner with everyone who'd made the trip north, a pleasant evening at the Hilltop Motel south of town, and a big breakfast with the gang before we all set off on our separate paths back home. 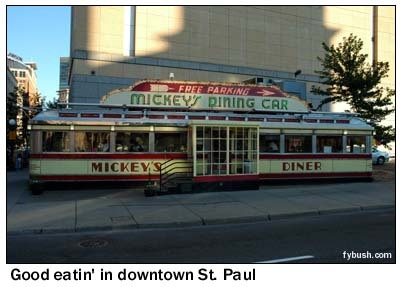 For our group, that would take another eight days, with more of Minnesota and all of Wisconsin still beckoning, beginning with a few stops two hours south of International Falls in Chisholm and Hibbing, the commercial hub of the Iron Range. 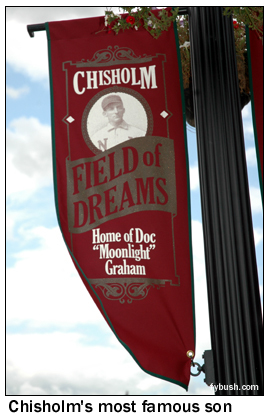 In any case, Chisholm has done well by "Doc" Graham, whose face appears on banners up and down the main street,which looks nothing much like the Chisholm seen in the movie. 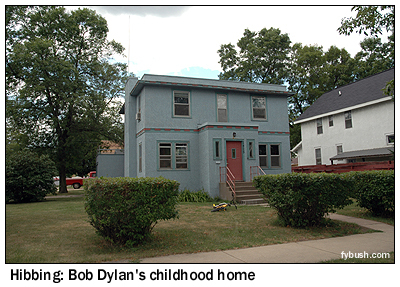 From Chisholm, it's just a short hop south to Hibbing, where our first stop finds us paying homage to that city's most famous product, known as Bobby Zimmerman when he lived at 2425 Seventh Avenue East. Today, the sign on the corner says "Bob Dylan Drive," and while Dylan himself doesn't come back to visit (so far as we know), the city celebrates "Dylan Days" every May. 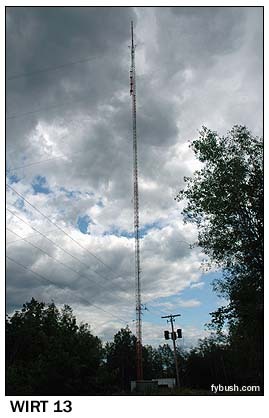 It does not, so far as we know, celebrate "The Only Place In America Where A "K" Callsign Station Shares A Tower With The Same "W" Callsign" Days, which is a shame, because it could - though we might be the only ones there. 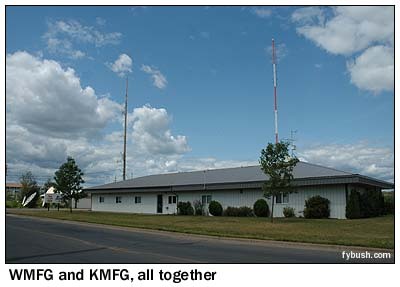 In any case, 807 W. 37th Street, on the south side of Hibbing, is indeed the only place where that happens, being home to WMFG (1240), WMFG-FM (106.3) and KMFG (102.9 Nashwauk), as well as studios for three more area stations that are part of the Midwest Communications family. 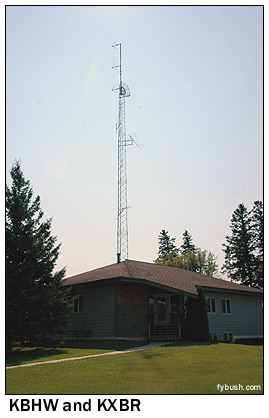 We find more of those stations at a five-tower site off Highway 73 south of town, where WNMT (650 Nashwauk) and WTBX (93.9 Hibbing) transmits. 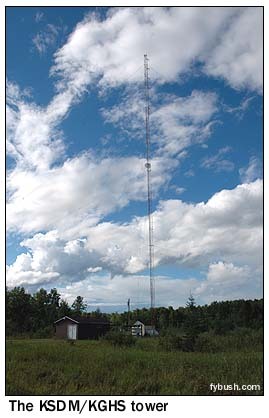 WNMT's a pretty powerful station, with 10 kW days and 1 kW nights. 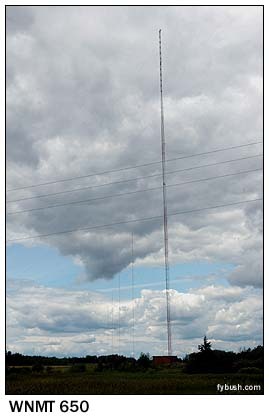 One more station, WUSZ (99.9 Virginia), also has a CP to use this site, and may even be on from here. And with still more daylight after dinner, we finished up with a few more St. Paul sites on the west side of town, heading towards Minneapolis. 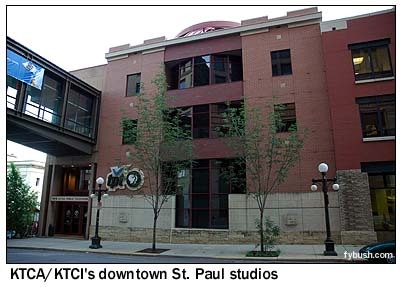 Little religious station KNOF (95.3) has its studio and tower on Selby Avenue, not far from the F. Scott Fitzgerald House to the east and Macalester College to the west, where WMCN (91.7) is off the air for the summer. 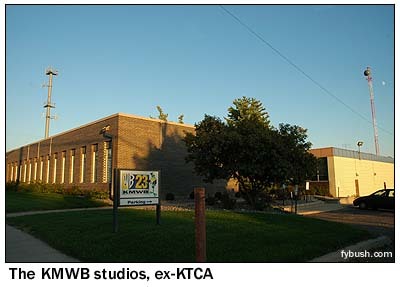 A mile or so to the north, across from the Minnesota State Fairgrounds on Como Avenue, a squat brick building is home to Sinclair's WB affiliate, KMWB (Channel 23) - but this building has a long history that predates the UHF station, having been home originally to KTCA, before it built its current home in downtown St. Paul. 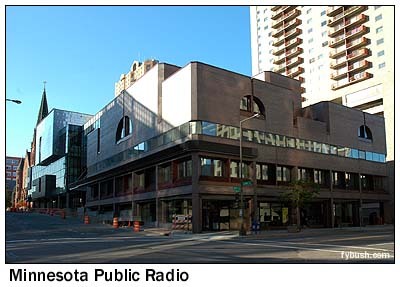 And then, right where University Avenue crosses the Minneapolis/St. 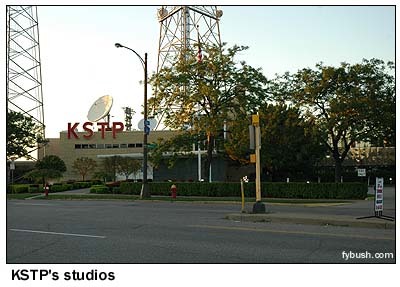 Paul line, we end our long day at the studios of Hubbard's KSTP (1500), KSTP-FM (94.5), WFMP (107.1), KSTP-TV (Channel 5) and KSTC (Channel 45), which are also the headquarters of Hubbard Broadcasting. 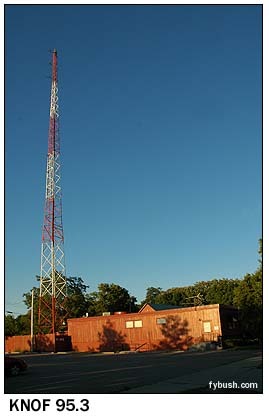 This facility was also the original KSTP-TV transmitter site, and I think the tower out back is still an active aux site for Channel 5. 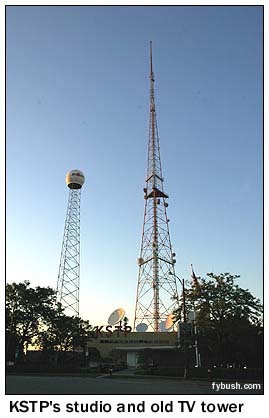 There's one more tower near here, which we can't quite get to and which didn't photograph well: KLBB (1400 St. Paul) is just south of KSTP, across busy I-94 next to the Mississippi River, with a nice signal into both sides of the Twin Cities core. Busy day? 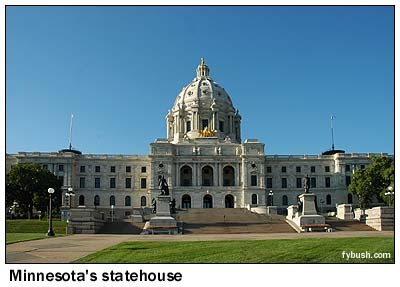 You bet - and there were still more Twin Cities sites to see on Day Four of the trip, the next morning. In next week's installment, we'll get up close and personal with WCCO and the Shoreview tower farm, before heading east to Eau Claire, Wisconsin. And in the meantime, hear all the IDs from the trip at Tophour.net - the International Falls and Iron Range IDs will be posted on Wednesday, March 1.